It was only near the quarter end, that’s what made it so unnerving. We may have become used to these calendar bottlenecks over the years, but they still remind us what they are. Late October 2012 was a little different, though. On October 29, the GC repo rate for UST collateral (DTCC) surged to 52.6 bps. The money market floor, so to speak, was zero at the time and IOER (the joke) 25 bps. We also have to keep in mind the circumstances of that particular period. The end of 2012 was nothing like it was supposed to have been. Unless you understood what had really happened in 2011, few did, this was going to be the year of full and complete recovery. Instead, economic data all over the world pronounced alarming weakness; a global slowdown of an “undetermined” nature. What transpired in liquidity trading merely consistent with all of that. Ben Bernanke panicked. FOMC colleagues like Jerome Powell told him to stay the course and hold on, the US economy merely needed more time to heal itself. The repo market, on the other hand, suggested that may not have been true. Bernanke opted for repo. Only, QE3 was announced in the middle of September 2012. The first transactions were executed under it in early October. The level of bank reserves began to rise yet the repo rate wouldn’t budge. 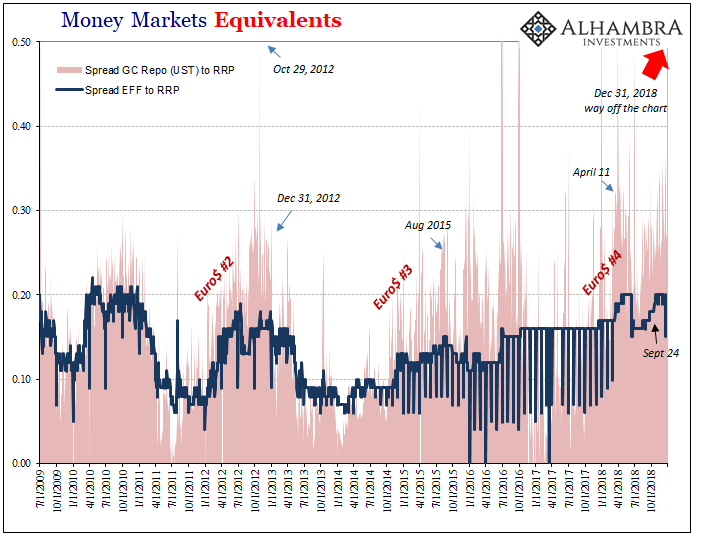 On October 29, it exploded upward while QE3 was in full swing. The result was QE4 in late December. Common convention assigns both those as a single program, the third when they were anything but. QE3, the MBS purchase version, wasn’t working. Bernanke believed the system needed another which is where the UST purchases of QE4 came from months later. The repo market in between showed the futility of either. If adding bank reserves didn’t lead to easing, how can fewer bank reserves result in tightening? If QE wasn’t E then QT isn’t T. What ended the rout in markets was the growing realizing in 2013 that the 2012 slowdown hit Europe with the recession but didn’t appear to be so serious elsewhere. Asia seemed to have been spared (until 2014). The repo market wouldn’t really calm down until May 2013 (Reflation #2).